The story of the Nigerian compulsory one-year graduate service is one that means different things to different people. The National Youth Service Corps (NYSC) – the name of the service body – brings memories to everyone who has undergone the service. Now, I wouldn’t bore you with the long history of its formation but let us just say that it was created by the General Yakubu Gowon administration as a way of rebuilding the nation by sending tertiary institute graduates (under thirty years old) to different parts of the nation to practice their studied course. Now, these graduates are first posted to states where they undergo some military and civil orientation in an ‘Orientation Camp’ for two to three weeks. At this time you would find lots of people from different ethnic backgrounds mixing together, many for the first time. In those few weeks, a lot happens – friendships are made, love groomed … The air there is like only what you would see on some of these survival shows like Big Brother, Survivor and the like. That time like the whole time in service varies for different people. The experience is different from camp to camp where some people enjoy themselves greatly while for others it turns out the opposite. So, to say, it is the fun time of camp for most people and the most horrible for others – depending on the way the camp officials (made up of civilian NYSC staff and military personnel) make it. This is where you find the most of Joshua Agbo’s Beyond the Dark Cloud (a fifty-four page play) set. The Corp members have just reported to camp in Kebbi state and seem excited. It takes just one night for a complete metamorphosis. They exchange rants on the usual troubles of the camp so far. For some, it is the right of equality expressed in the motto of the state ‘The Land of Equity’ where humans and animals have equal rights. For others it is the distance of the state. Somehow, several other issues come up, everyone with his or hers. With time, we are introduced to the State Coordinator of the programme, a professional and graduate of Constitutional Corruption (1st class) from the Institute of Strategic Stealing, and Masters from the same field. He is the author of two best-selling books, Steal the nation if you can and Crime without Conscience that have earned him the OON, MOON, GCN. The State Coordinator makes life unbearable for the Corp members on camp and they revolt. As a result, the soldiers are made to deal with them. Somehow, these Corp members pass out of the camp and move on to society and by extension their various places of assignments. The story concentrates not on these places of assignment but their place of abode, in particular the family house of the Nigerian Christian Corper’s Fellowship – which is something of a religious setting headed by the Dado who is the leader of the fellowship and his secretary, the Uncle. Over here, the Corp members live by biblical rules which of course are somehow not adhered to completely in some hypocritical stances. While others rise to complain, Najite (one of the main characters in the play) urges them to concentrate on the good and work to be better. End of story. The play is deeply satirical. It follows the tradition of plays like Soyinka’s The Beatification of Area Boy and Hyginus Ekwuazi’s Morning yet on Judgement Day (a book which is based on Corp members after service). The book has philosophy forced into its totality through the instrumentality of the character, Najite (who as we mentioned earlier is one of the main characters). You find the words of several philosophers flying through the pages from Liu Xiaobo to Fidel Castro, Philip Randolph, Bertolt Bretch and Amilthrar Cabral. Most of the words are vibrating ones to inspire people to action in the spirit of unionism and protests reminiscent of the student protests (do remember that the members of the camp are recent graduates from the university). These sharply bring to mind Helon Habila’s chapter ‘Bola’ in Waiting for an angel. Horace prescribes that the role of literature should be to instruct and entertain. Joshua seems to have this in mind. He tries to fill his play with sparks of humour to keep the reader entertained. For instance, we note an area where we are told of a certain pretty lady Corp member who faints during one of the military parade rehearsal. A fellow corp member from the Red Cross goes to save her but is pushed aside by a faster military officer who goes to ‘rescue’ the victim. The story changes when a Corp member not so pretty collapses. No one – not a Corp member or military – goes to her rescue. As a play, there’s no gainsaying that the author tries to inject a spirit of advocacy and forthrightness in his readers. His aim seems to show the side of the NYSC not always shown. It would seem that Joshua also hopes to create character change and urge people not to always criticise in every situation but also ponder on certain issues in some areas and give correction especially when they are in such capacities. 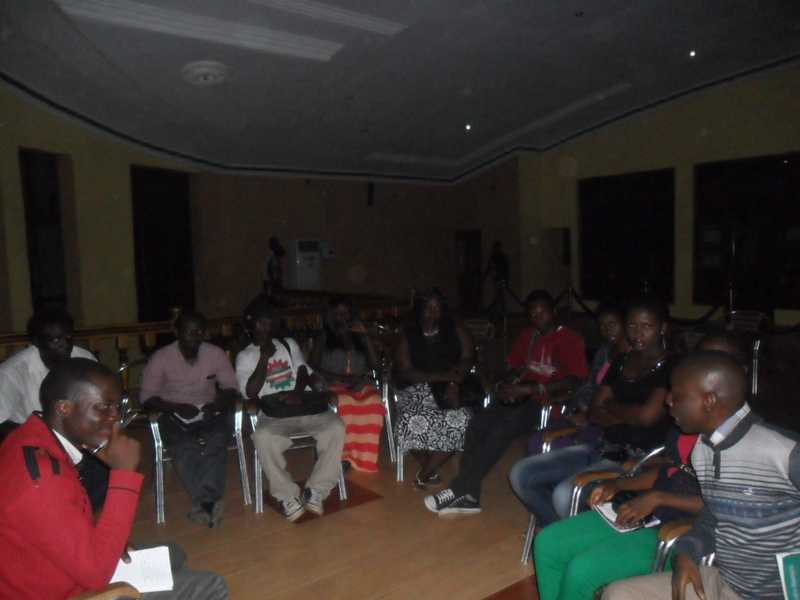 Better put, Joshua urges people to challenge the leadership where only instituted leadership can bring change as in the instance of Najite in the orientation camp. On other hand, there is the push for people to live exemplary lives and be their best while contributing their best as put forward by the same Najite to his colleagues in the NCCF family house. At many instances, constructive traits towards development as opposed to disastrous vengeful actions without motives are advised. 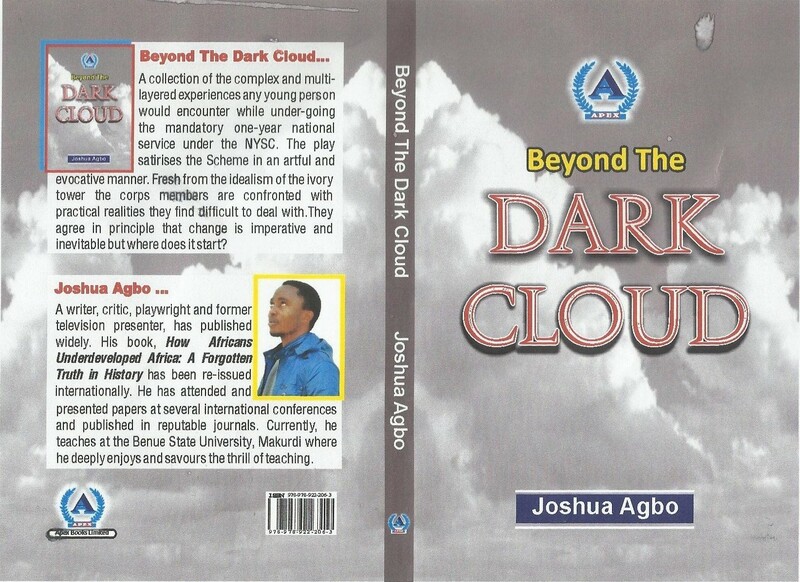 As said, Joshua’s Beyond the Dark Cloud is an instructive literary piece. For whatever shortcoming the play has in print, there is the task of the director to correct for the stage. That said, the play has the material that when translated by a good director would give a sour unromantic idea of the Nigerian National Orientation camp to any audience. It becomes pertinent at this point to remind us that this tale is simply a single story, an integral one but one not to be taken as a whole in itself but just a side to something bigger.